it features the following: a Blue/Purple and a dash of Lime Cocktail Headband (worth $24), a Lily Flower Filigree Ring in Lilac (worth $10) and a set of Four Petal Flower Post Earrings in Ash Black/Gray (worth $9). so what do you have to do to enter? simply leave a comment on this blog post telling us what your favourite item in the indie & chic shop is. you must also follow artsy ants (via twitter, a feadreader of your choice, bloglovin or google friend connect). the giveaway ends on Tuesday, May 8th, 2012 at 8 a.m. EST. the winner will be chosen via random.org. and announced here on the blog shortly after. the winner must contact us with his/her postal address within 7 days after the drawing to claim the prize or we will have to re-draw! oh yes, and this giveaway is open to readers all around the world! good luck everybody! What a sweet shop :) So many cute things but my heart skipped a beat when I saw the feather hair pins! I'd have to say the ring is my favorite :) Lovely giveaway! What an adorable shop. I really like the little bird earrings! 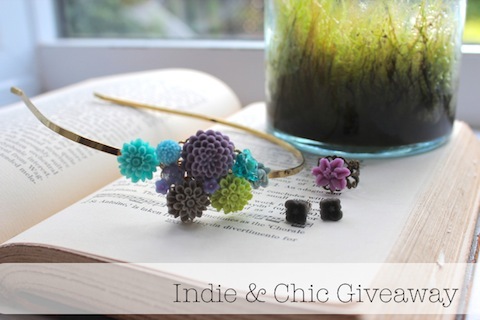 I really love her Chrysanthemum rings, but that headband is stunning and I would love to win it! My favorite is the rings especially the large peony flower ring and the cabbage rose rings. I think my favorites are the Gold Leaf Hair Clip and the Feather Hair Pins, but I have a weakness for attractive hair accessories. I'm also loving the Woodland Leaf Filigree Ring. The simple vintage headband is beautiful! I am following your blog! i am following you! i would love a headband to give to my 10 year old daughter. personally, i like the leaf clips, so sweet!